Clients must take car to nearby secured carpark who then transfer you back - Cost included in rate. 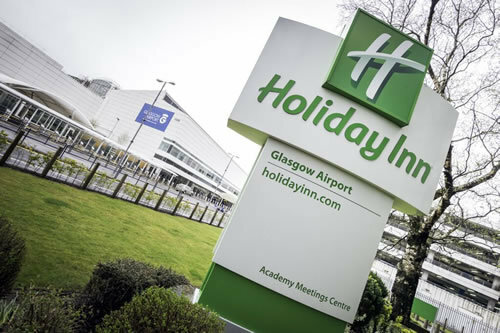 The Glasgow Holiday Inn hotel is conveniently situated on site at the airport just a few steps from the terminal. Inclusive parking is at a secured site. All rooms have en-suite bathroom, tea and coffee tray, interactive TV, direct dial telephone, trouser press and hair dryer. 3 suitable rooms are available and are situated on floors one to three. Clients must take car to nearby secured carpark. Cost included in rate. There is a £15.00 charge per car for over night car parking in the hotel car park. Any additional days parking required can be paid for directly to the car Park when dropping off your car. There is a restaurant and bar where light meals are available. Breakfast buffet is available at £12.95 per person. Children under 12 eat free when accompanying a paying adult. 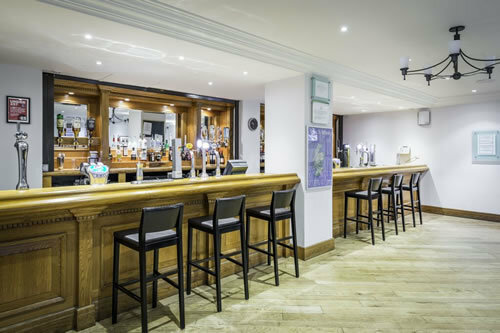 None within the hotel, but the hotel can offer use of a local David Lloyd Racquest & Health club for £12.00 per person per use. Guests would need to make their own way there. 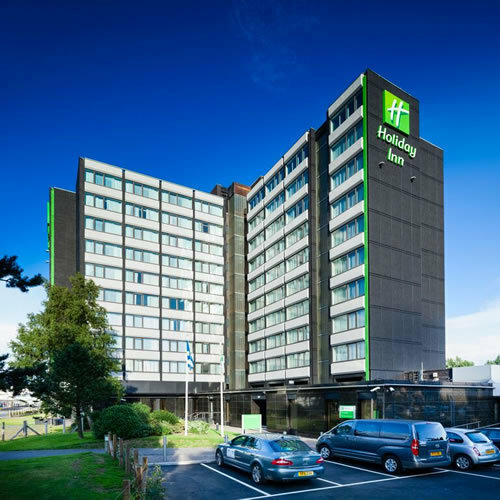 Just one of the many Hotels near Glasgow Airport available from FHR. Great hotel very spacious and comfortable. Good breakfast and evening meal. Staff friendly and helpful. Short walk across the road to the airport so well situated. The only problem was getting into the carparking area as there are no signs and the one way system is a nightmare. We went round and round and in the end went through a space in the fence !!! The hotel receptionist told us that the airport authorities would not allow them to erect signposts. Apart from that the hotel was great. You are not allowed to leave your car with the hotel for more than one night and are directed to a carpark some way away which again can be hard to find. This is the best hotel for an overnight stay before you fly. Just across from the terminal so no shuttle bus or long walk in the morning. You have to go to the hotel to get a voucher and directions for the car park but this is not a problem and it's great to offload your luggage from outside the front door. The rooms are reasonably spacious although the bathrooms are on the small side but it's only one night and it's very clean - and the bed is comfortable. It was quite cold in our room when we arrived this time but there was a small electric heater to supplement the aircon heating. We also had a meal in the restaurant this stay and it was very good with great service. I definitely recommend it! Very friendly staff. Walking distance to the airport. I also liked you could park your car at the hotel till you came back from holiday at a reasonable price. Would stay there again. Booking for two family rooms was easy, and hotel facilities were excellent. Very handy for airport. Did not have breakfast as we had an early flight. Room clean and comfortable. Easy and quick checkin and checkout. We got a very good deal for hotel and parking combined. Great service as always and would have given 5 stars but one issue was that the directions to the hotel were not that clear and did not work with our sat nav so we got a bit lost. Hotel was excellent, so glad I booked before flying. Staff on reception really helpful. We had a family room which was brilliant, plenty room big beds and a bonus having 2 separate sleeping bathroom/toilet areas. The only downside to the room for me was it was right next to the lift shaft and being a light sleeper it did keep me awake with the banging noise of the lift constantly going up and down, heavier sleeper would probably be ok. There was a very little bit of noise from aircraft but nothing that you could complain about. I would book again but maybe sleep in the other room. This is an ideal hotel for a morning flight. It saved us the stress of a long drive pre flight. The hotel room was clean and comfortable and the staff very friendly, courteous and helpful. Parking the car was straight forward with very little waiting time for transfers. We wouldnât hesitate in recommending this package. What could be more convenient that staying right across from the terminal building. On checking in the reception staff will give you details of the car parking facility that you are using and the direction to get you there. Simply drop off your car and a shuttle bus will take you bgack to the hotel. Have used this hotel before and definately will again. Convenient as we didn't need to get up too early for an early flight. Room size and facilities are pretty much standard for an airport hotel ie quite compact and functional. Overall it is good. Helpfull staff, very good family room. Good hotel, nice rooms, great breakfast, super convenient just across from terminal building. Wouldnât stay anywhere else if travelling from GlasgowAirport. Hotel with off site airport parking. Able to park car 1st then go to hotel which then is just a walk across the road to the airport. Very convenient. The hotel is extremely convenient fir airport, staff were helpful and friendly. Booked for an early flight departure. Directions to the hotel reception are not good. It is difficult not to end up in the (payment needed) airport car park, as you have to change into the correct left lane to enter the not very well indicated hotel. Then you have to drive your car to Linwood and get a shuttle back. Returning from our holiday, we had to wait for 20 minutes to gather together all those going back to collect the car by shuttle. The only plus was being able to walk over to the departure desk at 6 am.The room was not bad, but pretty small. Okay for the FHR price, not for Holiday Inn's! Everything went according to plan. Hotel great and bus was waiting outside the airport we we arrived home. Fairly difficult the entrance to the hotel with the result we had to pay Â£2 to get out of wrong lane! Not well sign posted at all. Tried to contact by mobile but again expensive line 0871 number cost Â£1.49! Eventually parked, checked in and got our parking ticket validated ( after going back to the car and realised this should have been done at reception). Was assured that the parking company knew we were arriving and not given any voucher at the hotel. The instructions given at FHR were to go to hotel and pick up parking voucher, we could have gone straight to the long stay park first. We were given the postcode for the car park and took a long time to locate where the parking area was, then at the barrier no one answered the intercom. Eventually got in and left to our own devices to find a parking space! What should have been fairly straightforward took over an hour to complete. On leaving the hotel next morning it was great ist to have to walk across the road to the departure area. From the M8 motorway exit at junction 28 onto Caledonian way. The Holiday Inn is situated along this road. Parking is provided at a secured car park. When you arrive at the hotel you will be given a voucher and directions to the car park. You can then drive to there to drop off your car. The car park will transfer you back to the terminal, which is opposite the hotel. Any additional days parking required can be paid for directly to the car park when dropping off your car. When you return from your holiday you will need to get the car park transfer bus back to the car park to collect your car. Buses run 24 hours a day and only take five minutes. There is a £15 charge per car for over night car parking in the hotel car park. No refund is made for a cancellation of al bookings within 24 Hours of the date of stay, e.g. for a booking for the 3rd August, cancellation should be made by midnight on 1st August. An administration fee of £10 per room per night applies, the balance to be refunded. HiYour family room says with a z bed. Do you have travel cots?Thank you for your enquiry If you only want a double with a cot, you will need to request the cot after you have booked the double room. There is no additional charge for cots. Hi, American trying to book two family rooms but only appears to have the option of one car. This would be a booking for two family rooms and two cars. Please help Thank you for your question. On the website you would need to request two family rooms with parking and it will give you prices. hi.how do people get between the hotel and the secure parkingOn arrival you drive from the hotel to the nearby car park. You then get the free car park transfer back to the airport, the hotel is opposite the terminal building. On return from your travel you get the car park bus straight back to the car park to collect your car.On arrival you drive from the hotel to the nearby car park. You then get the free car park transfer back to the airport, the hotel is opposite the terminal building. On return from your travel you get the car park bus straight back to the car park to collect your car. Does the price include parking from 22/8/14 to 05/9/14yes if you choose the 15 day parking option when your parkng will be included for those dates. 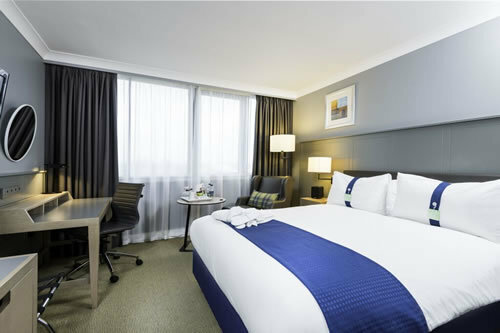 View all Glasgow Airport Hotel options available from FHR.